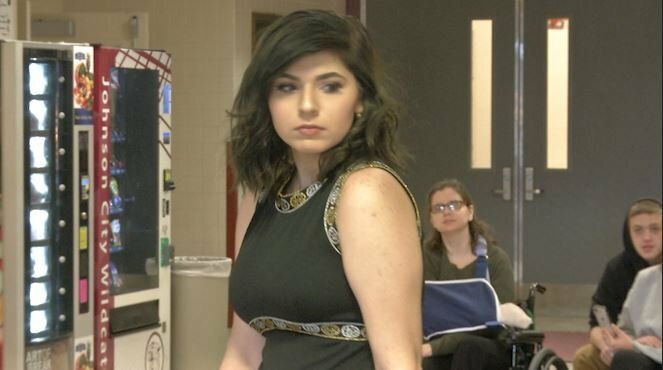 Johnson City students have been working for months for their "World of Fashion" class with all of the hard work accumulating into a fashion show on Saturday. Tahlik Ingram, a J-C student said that over a hundred students have been spending their time after school on Thursdays to help get the show ready. Students got to channel their inner models showing off fashion styles like casual and retro-themed apparel. All of the proceeds from today will go towards benefiting students who will take part in the Family, Career and Community Leaders of America Fashion and culinary competitions in March. While not all students involved in the Fashion Show modeled they all pitched in to make sure Saturday's show was the best it could be while even learning lessons along the way. Ingram said, "I've learned how to meet deadlines, speak up for myself because I use to be an introverted child, now I'm a little out there and im happy... that's helped me come out of my comfort zone".